Why & how ‘Clothing as a service’ will change the fashion system? For the past ten years I have done as much as possible to change the clothing industry to be more sustainable. One example of this is the sustainable clothing label, Nurmi, which I ran for five years. With the label I managed to do many things in a more sustainable manner: materials were ecological, manufacturing ethical and production transparent. But a few years ago I came to the conclusion that this is not enough. I cannot achieve a change big enough by designing and producing more. Because I still worked within the same clothing system which thrives only when we produce more and more, with lower and lower prices, faster and faster. No sustainability act within this system is enough when the system itself is the problem. We need a systemic change. Long-lasting and high-quality clothes has to become more profitable to produce than fast fashion. The way how to achieve a systemic change is to change the current clothing system to a ’Clothing as a service’ model. This means that clothes will become services and we won’t pay for the clothes but for using those clothes. The same way that for example in transportation we already have ‘Mobility as a service’. The current revenue model is based on making a profit when a piece of clothing is sold. The more you sell, the more you get. On the contrary, with the ‘Clothing as a service’ model the longer the piece of clothing stays in circulation and is rented, the bigger the profit. In other words, the better the quality, the bigger the profit. This model changes the current linear clothing lifecycle into a circular one. Clothing labels, shops and consumers can offer their clothes for rent and this way tap into a new revenue model and see clothes as investments, not as disposable goods. 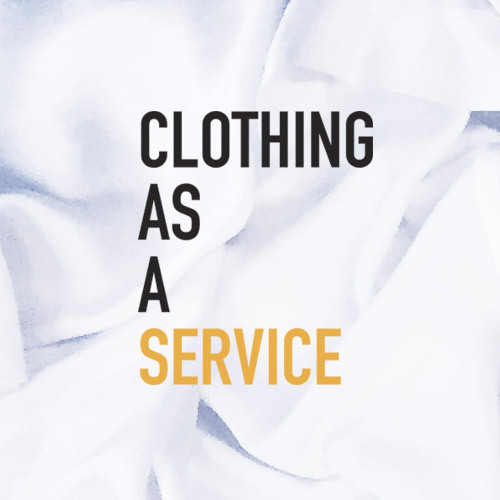 The clothing service itself is ran by “operators” which offer an easy and safe way for the users to rent clothes from a large variety of quality clothing. These operators can be both global online rental platforms but also local libraries or rent-in-shops. The whole system forms an ecosystem where also the producers have an important role. As only the long-lasting pieces are profitable in this model, the high-quality craftmanship will be valued again. When the main driving force is not the low price and fast speed any more, there’s a stronger incentive for the clothing companies to shift towards ecological materials and ethical manufacturing. As the clothes are kept in circulation for a long period of time through renting, there is also an incentive for revival of the forgotten craft of clothing care for both individuals and businesses. 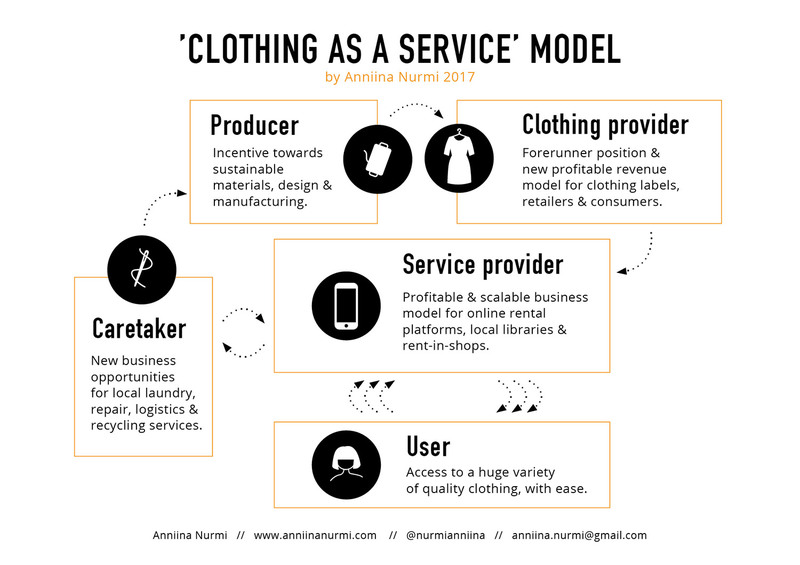 In this ‘Clothing as a service’ ecosystem there is a great business opportunity for local service providers, such as laundry, repair, logistics and recycling services. During the last year I have developed and tested one possible rental business model within the ‘Clothing as a service’ system: RINS, a peer-to-peer clothing rental platform. The lean testing has been really fruitful and it has given me a strong signal that there is a need for this kind of service and there are more and more people who are eager to change their consumption behaviour. Now I have come to the conclusion that I won’t be building the RINS service myself but instead I will concentrate on developing the ‘Clothing as a service’ system as a whole and offer my know-how to other companies and startups willing to develop their own business models within this system. This way my ten years knowledge of sustainable fashion is in best use. If you want to participate in the development of the future way of using clothes, welcome to join the discussion in the Facebook group ‘Clothing as a service’. If you wish to incorporate ‘Clothing as a service’ into your business, feel free to contact me & let’s talk more!